Rice is an important crop and consumed all over the world. Therefore producing a grain is of high economic value and gives good income. They following steps will help you start an incoming flowing Rice Farm. One important step in setting up a rice farm is selecting a gently sloping to flat land, with good water retention capacity. Also in selecting a Rice Farm consider a clay loam soil, rich in organic manure and not prone to periodic flood. First the land should be prepared and ploughed, and then harrow the ploughed land after 2weeks before planting begins. In order to obtain vigorous seedlings , it is recommended to sow approximately 0.2kg of seed per M2 to reach approximate density. A 2500M2 field contain seedlings from a 50M2 nursery which is Five 10M2 beds which will require 10kg of seeds. Make sure that good quality seeds are used. Install the nursery on appropriate soil, well ploughed and well leveled. When sowing, it is important to throw the grains with force into the sowing bed to fix them in mud, thus preventing them from being carried away by irrigation water. Make sure that irrigation is well managed and protect the beds from birds, animals and any other predator. 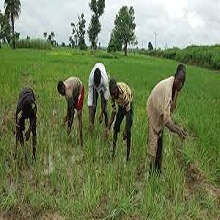 In Southern Nigeria, Rice seedling should be planted between May-June while in the Northern part it should be done between June-July , While with irrigated systems planting could start between March-April. Preferences should be given to transplanting and direct seeding using direct seed planter, this is to ensure appropriate plant population necessary for optimum productivity. The recommended spacing for rice field 20cm*20cm between plant and row, this enables farmer’s to buy 1 small granules of urea between 4 rice plants. NOTE: Gap filling of empty spaces should be done with seedlings within 7-10days after planting using left over seedlings from the nursery. Cattle or poultry manure, composts, Rice residues from last year. Use one bucket per square meter. If fresh, incorporate in the soil two months before planting your rice seedlings. NPK 200kg, Urea 100kg or 100kg each for NPK and urea respectively in nutrient rich soil. Apply NPK as basal fertilizer not more than one month after planting. Top dress with urea 6weeks after planting. Rice is a water loving plant, so control of water is critical. Always maintain the water level in the field up to 5cm from One week after planting until grain matures. Drain water, a week before harvesting and cracks should not be seen on field. Bunding is imperative for proper water management. Hand Weeding: This should be done after 14-20days after planting; First drain water from the field. Another weeding should be done around 30-48days. Chemical weeding: If chemical weeding should be done be applied identify if weed is Broad-leaf or grass. In grass: Use Basagram, Ronster or Orioles at recommended rates of 3kg for solid or 4-6litres fro liquid per hectare after 2-3weeks after planting. Harvesting of rice is done within 3-5months of maturity depending on rice specie, this is usually done when the grains are hard and have turned yellow/brown in colour. Cut the stems with sickle about 10-15cm above the ground. After harvesting rice crops , place in upright position for drying before threshing begins. Hope You Enjoyed Our Article. AMADI EKENNA DOMINIC is an African Based Blogger, Writer, Editor, Publisher and lover of science he is the CEO of agricgist.com,talkagric.site,scholarshipsark.com,yopostscom. This Good Fellow Takes Every information Vital and shares it with its Audience. He has great passion for agriculture and education and other related ideas. JOIN OTHERS,REGISTER FOR OUR ONLINE TRAINING FOR SNAIL,FISH,QUAIL,MUSHROOM,PIG,POULTRY FARMING VIA WHATSAPP FOR JUST 5000 NAIRA. EACH PROGRAM SELECTION WILL COACHED FOR 2WEEKS AND 3DAYS AND ITS COMES WITH AN EXCLUSIVE E-BOOK COVERING EACH FIELD. INTERESTED CALL MR EKEX @ 2347039482540 THANK YOU AND HAPPY PARTICIPATION. AGRICGIST is Website which focuses on Agric-Businesses, Loans and Grants, Agric Technology, News,Agric funding and other Agric-Related Ideas and Issues etc.